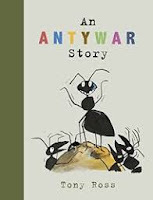 "Douglas watched the other ants form a beautiful line. All day, they hurried past carrying food. "Why do you do that?" asked Douglas. "So we can eat it over here," was the reply. "Why don't you eat it over there?" asked Douglas. "Let's not talk about it!" was the reply. Douglas thought that was a fine answer. Now he knew what he wanted to do with his life. He wanted to fit in, to carry food and be in the beautiful line." The ants in Douglas' world have no name. Well, other than Douglas that is. Even in the nursery, everyone knows who he is. The other ants are described with the letter A. Douglas would rather be like all the others. He wishes he could carry food as they do. Douglas has a different purpose in life. Douglas is a soldier ant. When the time comes, his destiny is to carry his rifle and protect Antworld from any future threat. He is meant to keep their world safe for all of the ants. He is very proud of the role set for him. big teeth." Douglas felt proud and very special. "We have you down as a soldier." Douglas is happy to join the other soldiers and do his duty. Then war rears its ugly head in the human world, and an attack destroys the anthill he is meant to protect, and all of the ants with it. Large black shells aimed right at the anthill, followed by a double-page spread wide BANG, and the story comes to an abrupt end. Only one somber image of human soldiers streaming across a war field at the SOMME, and a final look at a memorial covered with many letter As and the word 'Douglas' complete this thoughtful and meaningful book. It is what war has done, and can do again.